Have you ever had NAN show up, unannounced, in your data? Did you wonder who she is and how she got there? And, more importantly, what do you need to make her go away to get your data back? NAN means “not a number,” indicating an invalid measurement. She can show up when a sensor's output voltage exceeds the voltage input range specified in the measurement instruction. 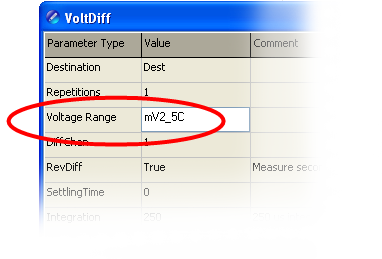 The values that end in C in the voltage range selection above check for an open input. That's what you get if one lead of your sensor becomes disconnected or broken. When that happens, again, NAN will show up as your measurement value. NANs are also caused by SDI-12 measurement problems and sometimes goofy math expressions like zero divided by zero. 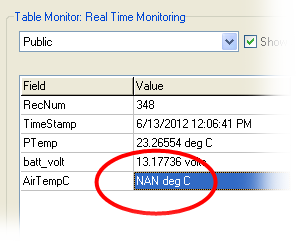 When NAN infiltrates your measurements, she can also turn up in your stored data. NAN is not all bad—she is a good indicator that you have a measurement problem, so you don't want to universally ignore her. However, you can program the datalogger to discard NANs from your data by using CRBasic's output instructions' DisableVar (short for “disable variable”) feature. DisableVar is used to determine whether a measurement is included in the output data. 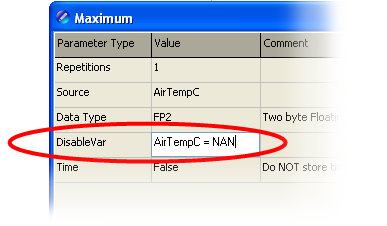 For example, in the case of an air temperature sensor, DisableVar can be set to AirTempC = NAN. Doing so will exclude NAN from the air temperature output data. If all the measurements in the output interval result in NAN, NAN will still be stored in the final storage regardless of what you've done with the DisableVar. If NAN shows up on your doorstep, look for the source of the problem. Connect all wires securely. Check cables for damage. 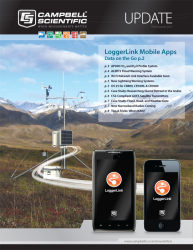 Match the sensor's output voltage range to the datalogger's input voltage range. Let's send NAN packing!